Steven (Chicagoland, United States) on 22 February 2016 in Landscape & Rural and Portfolio. Tucked inside the lush Tongass National Forest, discover an Alaskan botanical garden unlike anywhere else in the world. Vibrant hanging gardens spill from 15-foot-tall upside down tree “Flower Towers” and elegantly designed landscapes compliment the natural beauty of the rainforest. 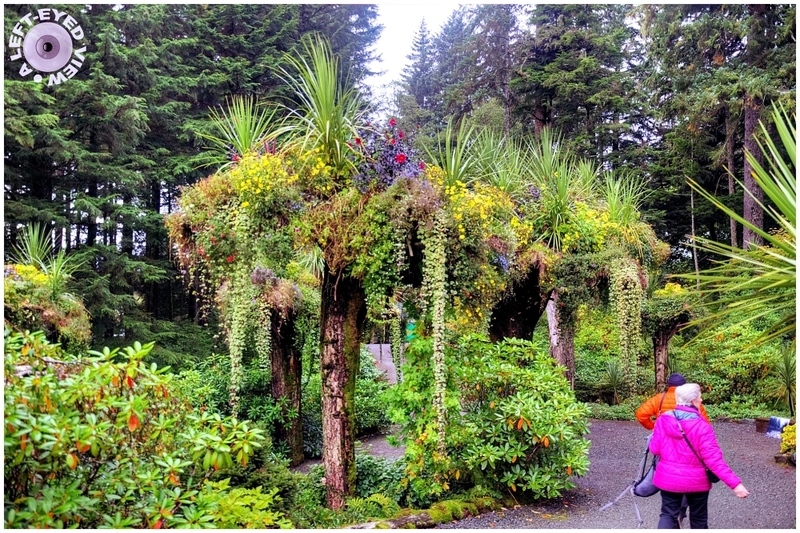 Explore these unique gardens on a guided tour in a covered vehicle, then travel through 50 acres of temperate rainforest. Who knew that a rainforest existed in Alaska??!! No tour gives you easier access to the Tongass, the largest national forest in the US. The tour is a great way to explore the rainforest, and includes panoramic views of Juneau. The vast gardens are the creation of Steve and Cindy Bowhay, former local commercial fishermen and master gardeners who purchased the property for a stream rehabilitation project. The project took on a life of its own, and they’ve developed a tour through two miles of trails of personally designed and installed botanical gardens. Here is another flower tower spotted inside the Glacier Gardens in Juneau, Alaska. These flower towers are actually tree trunks that are flipped upside down with the root balls of the trees forming planters for various plants and flower arrangements. These trees were a result of a major landslide that occurred in 1984. The owner of the property took these trees and flipped them upside down and planted them deep into the ground. Quel plaisir de voir cet environnement !! Wonderful shot of these marvelous flower towers. The tree creations are living works of art. A beautiful photo of these curious tree planters. This looks to be an especially nice cluster of them. The people who did this had a great idea. Gorgeous colors among the greens. with beautiful composition & lights! Quelle végétation luxuriante ! Merci pour tous les détails ! The idea of the inverted tree trunks used to create these magnificent aerial gardens still amazes me ... Superb image !!! The two tourists wear brighter colors than the flowers they are there to observe. It is just so interesting to me that this looks almost like a tropical rain forest but everybody is wearing coats! Gorgeous colors! Quel beau jardin et végétation quel personnages superbe.